Michael Bradley and the US had a nightmare against Ghana in the opening game for USMNT in World Cup 2014. We gave the ball away again and again, and seemed too scared to hold onto the ball. Hey. It happens. I was a little worried that this World Cup was picking up where 2010 left off for us, but was also hopeful it was just a one-off. We certainly had been playing some good soccer leading up the World Cup Finals. The game against Portugal started well for the US. Except for the early screw-up, we actually started playing soccer. Bradley’s combinations with Dempsey in the first half were particularly impressive. As the game wore on, Bradley’s influence waned. Jermaine Jones stepped forward as the heart and soul of the USMNT — the one whose performance the team could rally around. 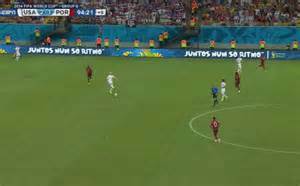 As the US applied pressure trying to equalize, there were multiple times our midfield received the ball from one side of the pitch, that, if we had realized we were not under pressure, could have easily switched play. Instead, we almost always one-touched the ball back to the same side of the pitch where it came from, back into traffic. I felt that Bradley, as one of our leaders and top players, was too guilty of this. Tellingly, it was Jones that took the shot for the equalizing goal. It was also Jones that made the defense-splitting pass that sprung Yedlin that led to the USMNT’s second goal. Thank goodness the Portuguese haven’t heard of keeping up with the Joneses. And what of the end of the game? We had the ball at our feet with 58 seconds to play. Yedlin had it in the corner. Klinsmann was pleading with the team to move back and get in a defensive position with less than a minute to go. But instead, with 45 seconds to play, we have three players, including one of our central midfielders, applying pressure near the Portuguese penalty area. Why? We had the ball again, at Michael Bradley’s feet, with 37 seconds left to play. Can someone let me know what he was thinking when he tried to dribble out of trouble? Was he trying to beat all three of those Portuguese midfielders at once? A coach of mine once yelled, when I tried to dribble out of trouble and lost the ball, “what, does everyone think they are Beckenbauer?” That’s what went through my mind when Bradley tried to take that ball down and dribble out of trouble. Bad decision. 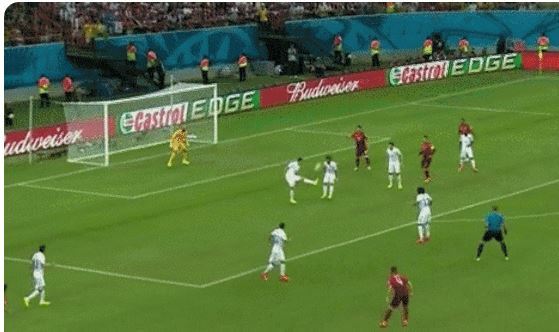 Geoff Cameron wasn’t ready at the beginning of the game to make a simple clearance that led to Portugal’s opening goal. And at the end of the game, after Bradley lost the ball with 35 seconds to play, you can watch Cameron make his way back to goal. He looks back up the field at the Portuguese players, but he doesn’t look behind him. Not. Once. There was a Portuguese forward lurking behind his shoulder, but he was unaware — he didn’t look around to see where everyone was. Ever. Bad decision. You can see, as Ronaldo’s cross comes in, Cameron doesn’t know that Portugal’s Varela is behind him. He is surprised as their forward beats him to the ball for the game tying goal. Cameron actually kicks Varela (accidentally) as he is scoring because he didn’t know Varela was there. Sometimes in soccer it’s your first touch that counts. And sometimes it’s your decision making. And sometimes “row Z” is the appropriate place to play the ball. Bradley did it in the waning minutes vs. Ghana. He made the decision to dribble the ball into the midfield rather than the corner flag, and he gave the ball away. Ghana was able to launch one more attack while we were hanging on for dear life. The British announcer was stunned. He said any experienced player would have taken it to the corner flag to salt away the game. And now today. Ball at our feet with less than a minute to play and a decision to make: do I bring it down in traffic and try to dribble out of trouble, or should I just kick the ball out of bounds to row Z and get our defense organized for the final 30 seconds of the game? To all young American soccer players everywhere: Sometimes Row Z is the best option! You might not look the best doing it, but you also have to think: what is going to get us the win? Eric, thanks for the summary! You see things I don’t! Good stuff man…glad ur enjoying the games!